Hello music video lovers far and wide! 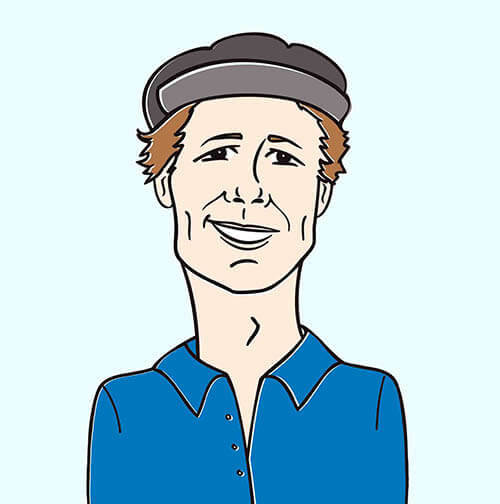 It’s Andy Gesner and the staff from HIP Video Promo, back again with another terrific clip from an exciting young band just beginning to gather notice. Last year, when we first got the press release for the New Pornographers’ Twin Cinema, we were interested to see that Carl Newman had added another singer and piano player to his band of Canadian indiepop champions. Further reading revealed that Kathryn Calder, the new member was in fact Newman’s long-lost niece, and a founding member of a British Columbian indiepop outfit of her own: Immaculate Machine. Calder toured with the New Pornographers, and won hearts across North America, and, in so doing, heightened hipster curiosity about Immaculate Machine and its self-titled debut album. Now the word is out: Immaculate Machine is pretty damned great in its own right. The influence of The New Pornographers (or perhaps just the influence of Carl Newman’s many influences) is apparent, but there are also echoes here of fellow Canadians Wolf Parade and Arcade Fire, early Talking Heads, and Hatful of Hollow-era Smiths. But mostly, the trio makes music that isn’t comfortably categorizable, and doesn’t conform to the conventions of any particular trend. All three members of the band sing – often at once – and guitarist Brooke Gallupe’s David Byrne-like wail and drummer Luke Koslowski’s shouts are perfect counterpoints to Calder’s sweet delivery. Most remarkable are the small-combo arrangements on Ones and Zeros: the band doesn’t use bass guitar. Instead, the dextrous Calder covers the bottom end with her left hand while she scrawls out melodic passages with her right. 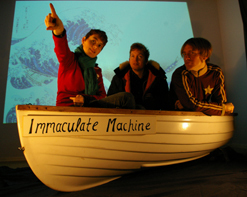 Every Immaculate Machine song is distinctive, and seems to come at the listener from a slightly different direction. “Broken Ship”, the lead track on Ones and Zeros, shows the band at its most immediate, tuneful, and engaging. Kathryn Calder takes the lead here, supported by Gallupe’s chanted backing vocals and percussive rhythm guitar. It’s a song that suggests danger and difficult choices, and Calder discharges it with a note of defiance in her voice. If “Broken Ship” feels conflicted and imperiled, Caleb Bayer’s video for the song is pure fun. He casts Calder as an aspiring (and hardworking) ping-pong champion. We watch her jogging, lifting weights, working on her paddle forehand in a suburban garage, and sparring with a punching bag decorated with a picture of her opponent. Drummer Koslowski plays the comically arrogant title-holder – and Bayer juxtaposes his complacency with Calder’s diligence in shots reminiscent of the training images in Rocky III. Meanwhile, Brooke Gallupe is a toady-scientist hired to throw the game to Koslowki – but we soon learn that he’s got an agenda of his own hidden behind his obsequiousness. The match is played in front of a comically small grandstand, but the combatants approach it with the utmost intensity. When Gallupe activates the remote control chip he’s implanted on Calder’s paddle, the crowd flees in panic, and he takes advantage of the opportunity by swiping the trophy for himself. It is a real joy for us to bring you new and exciting music, and we are thrilled to be working in tandem with Kevin Beesley, Randy Iwata, and Yvette Ray at Mint Records to be doing just that. You can catch Immaculate Machine touring the US for the entire month of July. If you would like to see them live, set up video interviews and IDs or would like copies of Ones and Zeros, please let us know and we’d be happy to oblige. If you need more info, call Andy Gesner at 732-613-1779 or e-mail us at info@HIPVideoPromo.com . You can also visit www.mintrecs.com or www.immaculatemachine.com to find out more about Immaculate Machine.